Have you ever witnessed an event inside water? Have you ever built a Submarine which can do basic tasks under water? Want a platform to showcase your talent? We present Submerge - an opportunity for you to show your talent and win exciting prizes. Submerge is a Submarine event where participants are required to bring a Submarine with the required specifications. They must compete on a given underwater track prepared with certain difficulties. The last date for abstract submission is 6th Mar 2019 (extended). The power supply method should be explained in detail along with proper diagrams. Picture(s) showing these can be attached. The specifications of all the components used including motors, remote controller, wires, battery, etc. must be mentioned. This round is to test the upward, downward, forward, backward and circular flow of the submarine. Teams need to complete a particular track inside water. Points will be awarded based on the time taken. Teams with the least points will be eliminated. This round is to test the strength and amount of work, the submarine can perform under water. Points will be awarded based on the time taken. Teams with the least points will be eliminated. The size of the submarine must not exceed 40 cm x 40 cm x 40 cm. The size constraint doesn’t include the remote used to control the submarine. The submarine can be wired or wireless. The submarine should not be made from any ready-made assembly kits. The teams must bring their own power-supply for the event. However, a running power supply will be given. The decision taken by the event managers will be final and binding. Maximum of 5 members in a team. Team members can be from different colleges. All students with a valid identity card from their respective educational institution and a Pragyan ID are eligible to participate in Submerge. The points will be awarded based on the time taken to complete the track. Negative points will be awarded for skipping or touching the obstacles. Points will be awarded based on the time taken to complete the task. 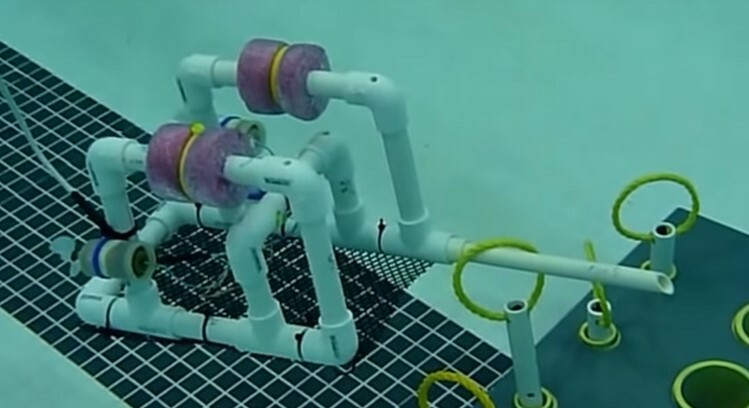 Design and construct a remote-controlled bot that can operate underwater. This bot will be tested for speed, maneuverability and handling on the various tasks which happens under water. The bot should have a stationary extended arm (as shown below) that can be used for picking and placing floating rings. Q) Is it a maximum of 5 people per team or strictly a team of 5? A) Maximum of 5 people per team. A) No, except for the registration in Pragyan, no special fee is needed. A) As soon as the evaluation of the abstract round is done, you will be intimated over the email for the same, if qualified. Q) Are on-spot registrations allowed? Q) Is there any restriction on the weight of the craft? Q) How many people can control the submarine? A) Only one person can control the submarine. Q) Should the model for first and second round be the same?